So what happened to and for women, in our government’s latest leadership convulsion? Inexplicable madness again overtook the nation’s parliament and another Prime Minister, the fifth in eight years, was dethroned. If you are feeling giddy you’re not alone. There are young Australians who have never seen the Prime Minister they thought they voted for, finish a term of government. Both sides were doing it and we are all the poorer for this paltry Game of Thrones. Where will women be, when the dust settles, when the political warriors sheath their swords and some of the blood dries? 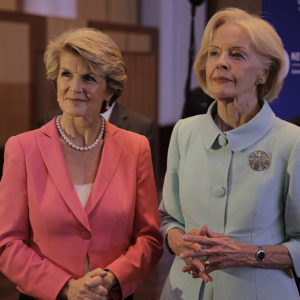 Well, amid the rubble Australia has lost the most senior woman in government. After ten years loyal service as deputy to a cascade of different Liberal leaders, Julie Bishop was elbowed aside by the blokes when she dared put her hand up to be PM. Popular with the public and respected internationally, Julie Bishop was run over by a stampede of many less capable and experienced men. They’re still huffing and puffing, barely noticing that Australia has lost a well-regarded Foreign Minister and the Liberal party has lost one of its champion fundraisers much sought after in its marginal seats. As my kids would say: Epic Fail! Senator Marise Payne has been moved from Defense to Foreign Affairs. So where there were two senior women in Cabinet we now have only one. Michaelia Cash has been demoted and Concetta Fierravanti-Wells fired. Kelly O’Dwyer held onto the Women’s portfolio along with Industrial relations. Perhaps aware of the optics, the new PM has hustled two new women straight into the Cabinet, Karen Andrews in Industry and Melissa Price given the politically fraught Environment portfolio. I hope these women are supported and mentored as they get up to speed in their new jobs in the fraught flurry before a general election, due in a matter of months. And among the wreckage a female backbencher Julia Banks has now quit in despair at the ‘vindictive grudges’ that propelled this political maelstrom. Looking for some silver lining for women, I discovered this lovely story. When Sarah Henderson made it to parliament in 2013 she made history as part of the first Mother-Daughter elected representatives. Her mother Ann Henderson was the Minister for Housing in the Victorian government in 1990s. This week Sarah was appointed assistant minister for Social Services and Housing. 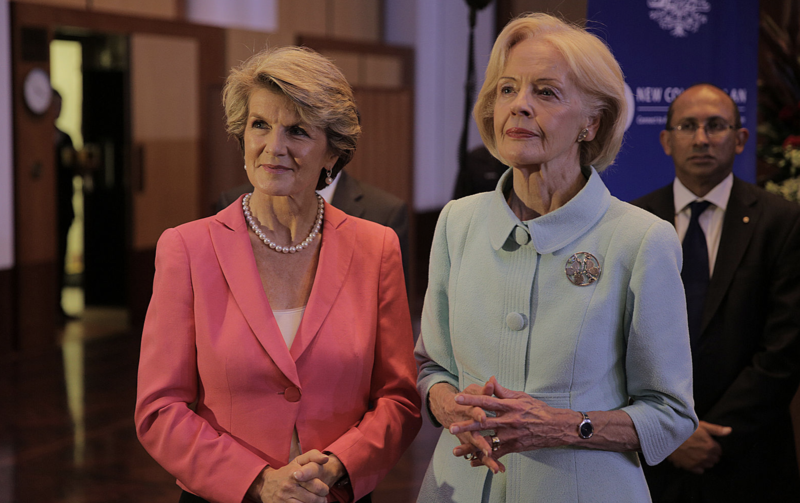 Both Ann and Sarah Henderson are honoured through Her Place as civic Firsts, alongside Julie Bishop Australia’s first female Foreign Minister Quentin Bryce, our first female Governor-General, and Julia Gillard, Australia’s first female Prime Minister. Ditto. Couldn’t agree more. Julie Bishop respected on both sides of politics & internationally. She was strong & grew as our first Foreign Minister & Deputy Prime Minister. I admire her poise, intelligence, diplomacy & tenacity. She has been treated abysmally & our country is poorer for her not being in our parliament. It is very sad. The loss of this most impressive foreign minister through political manipulation is not just sad, it is a tragedy for our nation in currently perilous times. What an incredible waste of ability and experience.